Council Directive 91/439/EEC of 29 July 1991 on driving licences (3) has been significantly amended on several occasions. Now that new amendments are being made to the said Directive, it is desirable, in order to clarify matters, that the provisions in question should be recast. The rules on driving licences are essential elements of the common transport policy, contribute to improving road safety, and facilitate the free movement of persons taking up residence in a Member State other than the one issuing the licence. Given the importance of individual means of transport, possession of a driving licence duly recognised by a host Member State promotes free movement and freedom of establishment of persons. Despite the progress achieved with harmonising the rules on driving licences, significant differences have persisted between Member States in the rules on periodicity of licences renewal and on subcategories of vehicles, which needed to be harmonised more fully, in order to contribute to the implementation of Community policies. The possibility of laying down national provisions with regard to the period of validity provided for in Directive 91/439/EEC leads to the co-existence of different rules in different Member States and over 110 different models of driving licences valid in the Member States. This creates problems of transparency for citizens, police forces and the administrations responsible for the administration of driving licences and leads to the falsification of documents which sometimes date back several decades. In order to prevent the single European driving licence model from becoming an additional model to the 110 already in circulation, Member States should take all necessary measures to issue this single model to all licence holders. This Directive should not prejudice existing entitlements to drive granted or acquired before its date of application. Driving licences are mutually recognised. Member States should be able to apply the period of validity prescribed by this Directive to a licence without a limited administrative validity issued by another Member State and whose holder has resided on their territory for more than two years. The introduction of a period of administrative validity for new driving licences should make it possible to apply at the time of periodic renewal the most recent counter-falsification measures and the medical examinations or other measures provided for by the Member States. On road safety grounds, the minimum requirements for the issue of a driving licence should be laid down. Standards for driving tests and licensing need to be harmonised. To this end the knowledge, skills and behaviour connected with driving motor vehicles should be defined, the driving test should be based on these concepts and the minimum standards of physical and mental fitness for driving such vehicles should be redefined. Proof of fulfilment of compliance with minimum standards of physical and mental fitness for driving by drivers of vehicles used for the transport of persons or goods should be provided when the driving licence is issued and periodically thereafter. Such regular control in accordance with national rules of compliance with minimum standards will contribute to the free movement of persons, avoid distortions of competition and better take into account the specific responsibility of drivers of such vehicles. Member States should be allowed to impose medical examinations as a guarantee of compliance with the minimum standards of physical and mental fitness for driving other motor vehicles. For reasons of transparency, such examinations should coincide with a renewal of driving licences and therefore be determined by the period of validity of the licence. It is necessary to strengthen further the principle of progressive access to the categories of two-wheeled vehicles and to the categories of vehicles used for the transport of passengers and goods. Nevertheless, Member States should be allowed to set a higher age limit for the driving of certain categories of vehicles in order to further promote road safety; Member States should in exceptional circumstances be allowed to set lower age limits in order to take account of national circumstances. The definitions of the categories should reflect to a greater extent the technical characteristics of the vehicles concerned and the skills needed to drive a vehicle. Introducing a category of driving licences for mopeds will, in particular, increase road safety as regards the youngest drivers who, according to the statistics, are the hardest hit by road accidents. Specific provisions should be adopted to make it easier for physically disabled persons to drive vehicles. For reasons connected with road safety, Member States should be able to apply their national provisions on the withdrawal, suspension, renewal and cancellation of driving licences to all licence holders having acquired normal residence in their territory. The model driving licence as set out in Directive 91/439/EEC should be replaced by a single model in the form of a plastic card. At the same time, this model driving licence needs to be adapted on account of the introduction of a new category of driving licences for mopeds and of a new category of driving licences for motorcycles. The introduction of an optional microchip in the new plastic card model driving licence should enable the Member States to further improve the level of anti-fraud protection. Member States should have flexibility to include national data on the chip provided that it does not interfere with commonly accessible data. The technical requirements for the microchip should be determined by the Commission, assisted by the committee on driving licences. Minimum standards concerning access to the profession of examiner and examiner training requirements should be established in order to improve the knowledge and skills of examiners thereby ensuring a more objective evaluation of driving licence applicants and achieving greater harmonisation of driving tests. The Commission should be allowed to undertake the adaptation of Annexes I to VI to scientific and technical progress. In particular, the Commission should be empowered to establish the criteria necessary for the application of this Directive. Since those measures are of general scope and are designed to amend non-essential elements of this Directive, they should be adopted in accordance with the regulatory procedure with scrutiny provided for in Article 5a of Decision 1999/468/EC. Since the objectives of this Directive cannot be sufficiently achieved by the Member States and can therefore, by reason of their scale and their effects, be better achieved at Community level, the Community may adopt measures, in accordance with the principle of subsidiarity as set out in Article 5 of the Treaty. In accordance with the principle of proportionality, as set out in that Article, this Directive does not go beyond what is necessary in order to achieve those objectives. 1. Member States shall introduce a national driving licence based on the Community model set out in Annex I, in accordance with the provisions of this Directive. The emblem on page 1 of the Community model driving licences shall contain the distinguishing sign of the Member State issuing the licence. 2. Without prejudice to data protection rules, Member States may introduce a storage medium (microchip) as part of the driving licence, as soon as the requirements concerning the microchip referred to in Annex I, which are designed to amend non-essential elements of this Directive, by supplementing it, are laid down by the Commission in accordance with the procedure referred to in Article 9(2). These requirements shall provide for EC type-approval, which shall only be granted when the ability to resist attempts to tamper with or alter data is demonstrated. 3. The microchip shall incorporate the harmonised driving licence data specified in Annex I. After consulting the Commission, Member States may store additional data, provided that it does not in any way interfere with the implementation of this Directive. In accordance with the procedure referred to in Article 9(2), the Commission may amend Annex I in order to guarantee future interoperability. 4. With the agreement of the Commission, Member States may make to the model set out in Annex I such adjustments as are necessary for computer processing of the driving licence. 1. Driving licences issued by Member States shall be mutually recognised. 2. When the holder of a valid national driving licence without the administrative validity period set out in Article 7(2) takes up normal residence in a Member State other than that which issued the driving licence, the host Member State may apply to the licence the administrative validity periods set out in that Article by renewing the driving licence, as from 2 years after the date on which the holder has taken up normal residence on its territory. 1. Member States shall take all necessary steps to avoid any risk of forgery of driving licences, including that of model driving licences issued before the entry into force of this Directive. They shall inform the Commission thereof. 2. 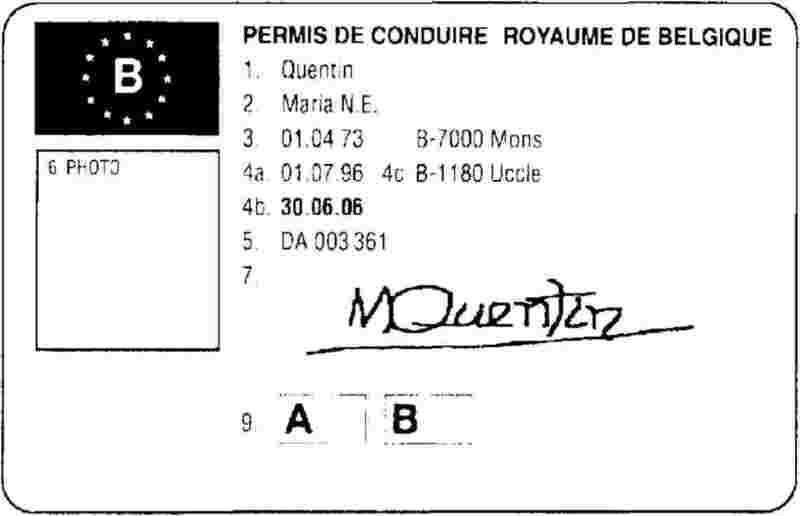 The material used for the driving licence, as set out in Annex I, shall be made secure against forgery in application of specifications designed to amend non-essential elements of this Directive, by supplementing it, which are to be laid down by the Commission in accordance with the procedure referred to in Article 9(2). Member States are free to introduce additional security features. 3. Member States shall ensure that, by 19 January 2033, all driving licences issued or in circulation fulfil all the requirements of this Directive. 1. The driving licence provided for in Article 1 shall authorise the driving of power-driven vehicles in the categories defined hereafter. It may be issued from the minimum age indicated for each category. A ‘power-driven vehicle’ means any self-propelled vehicle running on a road under its own power, other than a rail-borne vehicle. The minimum age for category A is fixed at 20 years. However, access to the driving of motorcycles of this category shall be subject to a minimum of two years' experience on motorcycles under an A2 licence. This requirement as to previous experience may be waived if the candidate is at least 24 years old. The minimum age for motor tricycles exceeding 15 kW is fixed at 21 years. motor vehicles with a maximum authorised mass not exceeding 3 500 kg and designed and constructed for the carriage of no more than eight passengers in addition to the driver; motor vehicles in this category may be combined with a trailer having a maximum authorised mass which does not exceed 750 kg. a test of skills and behaviour has been passed. Member States may also require both such a training and the passing of a test of skills and behaviour. Member States shall indicate the entitlement to drive such a combination on the driving licence by means of the relevant Community code. 5. With the agreement of the Commission, Member States may exclude from the application of this Article certain specific types of power-driven vehicle such as special vehicles for disabled persons. Member States may exclude from the application of this Directive vehicles used by, or under the control of, the armed forces and civil defence. for categories B and BE down to 17 years. vehicles undergoing road tests for repair or maintenance purposes. Driving licences issued to persons at a lower age than set out in paragraphs 2 to 4 in accordance with this paragraph shall only be valid on the territory of the issuing Member State until the licence holder has reached the minimum age limit set out in paragraphs 2 to 4. Member States may recognise the validity on their territory of driving licences issued to drivers under the minimum ages set out in paragraphs 2 to 4. 1. Driving licences shall state the conditions under which the driver is authorised to drive. 2. If, because of a physical disability, driving is authorised only for certain types of vehicle or for adapted vehicles, the test of skills and behaviour provided for in Article 7 shall be taken in such a vehicle. licences for categories BE, C1E, CE, D1E and DE shall be issued only to drivers already entitled to drive vehicles in categories B, C1, C, D1 and D respectively. licences granted for categories A, B, C or D shall be valid for categories A1, A2, B1, C1, or D1 respectively. category A1 motorcycles under a licence for category B. As this paragraph is only valid on their territories, Member States shall not indicate on the driving licence that a holder is entitled to drive these vehicles. vehicles of a maximum authorised mass exceeding 3 500 kg by holders over 21 years old of a driving licence for category B which was obtained at least two years before, provided that the main purpose of the vehicles is to be used only when stationary as an instructional or recreational area, and that they are being used by non-commercial bodies for social purposes and that vehicles have been modified so that they may not be used either for the transport of more than nine persons or for the transport of any goods other than those strictly necessary for their purposes. who have passed a theory test only as regards category AM; Member States may require applicants to pass a test of skills and behaviour and a medical examination for this category. who have their normal residence in the territory of the Member State issuing the licence, or can produce evidence that they have been studying there for at least six months. As from 19 January 2013, licences issued by Member States for categories AM, A1, A2, A, B, B1 and BE shall have an administrative validity of 10 years. The presence of a microchip pursuant to Article 1 shall not be a prerequisite for the validity of a driving licence. The loss or unreadability of the microchip, or any other damage thereto, shall not affect the validity of the document. normal residence in the territory of the Member State issuing the licence, or evidence that applicants have been studying there for at least six months. Member States may, when renewing driving licences in categories AM, A, A1, A2, B, B1 and BE, require an examination applying the minimum standards of physical and mental fitness for driving set out in Annex III. Member States may limit the period of administrative validity set out in paragraph 2 of driving licences issued to novice drivers for any category in order to apply specific measures to such drivers, aiming at improving road safety. Member States may limit the period of administrative validity of the first licence issued to novice drivers for categories C and D to 3 years in order to be able to apply specific measures to such drivers, so as to improve their road safety. Member States may limit the period of administrative validity set out in paragraph 2 of individual driving licences for any category in case it is found necessary to apply an increased frequency of medical checks or other specific measures such as restrictions for traffic offenders. Member States may reduce the period of administrative validity set out in paragraph 2 of driving licences of holders residing on their territory having reached the age of 50 years in order to apply an increased frequency of medical checks or other specific measures such as refresher courses. This reduced period of administrative validity can only be applied upon renewing the driving licence. 4. Without prejudice to national criminal and police laws, Member States may, after consulting the Commission, apply to the issuing of driving licences the provisions of their national rules relating to conditions other than those referred to in this Directive. In order to facilitate the checks pursuant to point (b), Member States shall use the EU driving licence network once it is operational. Without prejudice to Article 2, a Member State issuing a licence shall apply due diligence to ensure that a person fulfils the requirements set out in paragraph 1 of this Article and shall apply its national provisions on the cancellation or withdrawal of the right to drive if it is established that a licence has been issued without the requirements having been met. The amendments necessary to adapt Annexes I to VI to scientific and technical progress shall be adopted in accordance with the procedure referred to in Article 9(2). 1. The Commission shall be assisted by the committee on driving licences. From the entry into force of this Directive, driving examiners shall meet the minimum standards set out in Annex IV. Driving examiners already working in that capacity before 19 January 2013 shall be subject only to the requirements concerning quality assurance and regular periodic training measures. 1. Where the holder of a valid national driving licence issued by a Member State has taken up normal residence in another Member State, he may request that his driving licence be exchanged for an equivalent licence. It shall be for the Member State effecting the exchange to check for which category the licence submitted is in fact still valid. 2. Subject to observance of the principle of territoriality of criminal and police laws, the Member State of normal residence may apply its national provisions on the restriction, suspension, withdrawal or cancellation of the right to drive to the holder of a driving licence issued by another Member State and, if necessary, exchange the licence for that purpose. 3. The Member State effecting the exchange shall return the old licence to the authorities of the Member State which issued it and give the reasons for doing so. 4. A Member State shall refuse to issue a driving licence to an applicant whose driving licence is restricted, suspended or withdrawn in another Member State. A Member State shall refuse to recognise the validity of any driving licence issued by another Member State to a person whose driving licence is restricted, suspended or withdrawn in the former State's territory. A Member State may also refuse to issue a driving licence to an applicant whose licence is cancelled in another Member State. 5. 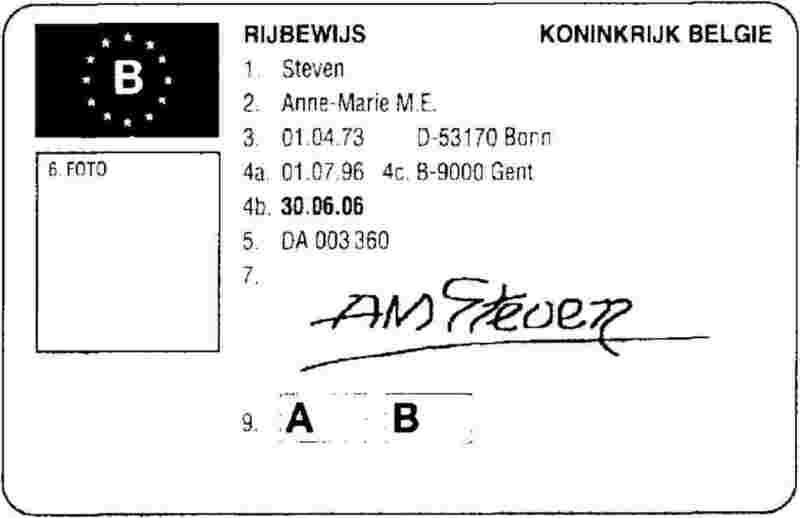 A replacement for a driving licence which has, for example, been lost or stolen may only be obtained from the competent authorities of the Member State in which the holder has his normal residence; those authorities shall provide the replacement on the basis of the information in their possession or, where appropriate, proof from the competent authorities of the Member State which issued the original licence. 6. Where a Member State exchanges a driving licence issued by a third country for a Community model driving licence, such exchange shall be recorded on the Community model driving licence as shall any subsequent renewal or replacement. Such an exchange may occur only if the licence issued by the third country has been surrendered to the competent authorities of the Member State making the exchange. If the holder of this licence transfers his normal residence to another Member State, the latter need not apply the principle of mutual recognition set out in Article 2. For the purpose of this Directive, ‘normal residence’ means the place where a person usually lives, that is for at least 185 days in each calendar year, because of personal and occupational ties, or, in the case of a person with no occupational ties, because of personal ties which show close links between that person and the place where he is living. However, the normal residence of a person whose occupational ties are in a different place from his personal ties and who consequently lives in turn in different places situated in two or more Member States shall be regarded as being the place of his personal ties, provided that such person returns there regularly. This last condition need not be met where the person is living in a Member State in order to carry out a task of a definite duration. Attendance at a university or school shall not imply transfer of normal residence. 1. With the agreement of the Commission, Member States shall establish equivalences between entitlements obtained before the implementation of this Directive and the categories defined in Article 4. After consulting the Commission, Member States may make to their national legislation such adjustments as are necessary for the purpose of implementing the provisions of Article 11(4), (5) and (6). 2. Any entitlement to drive granted before 19 January 2013 shall not be removed or in any way qualified by the provisions of this Directive. The Commission shall report on the implementation of this Directive, including its impact on road safety, not earlier than 19 January 2018. Member States shall assist one another in the implementation of this Directive and shall exchange information on the licences they have issued, exchanged, replaced, renewed or revoked. They shall use the EU driving licence network set up for these purposes, once this network is operational. 1. Member States shall adopt and publish, not later than 19 January 2011, the laws, regulations and administrative provisions necessary to comply with Article 1(1), Article 3, Article 4(1), (2), (3) and (4)(b) to (k), Article 6(1), (2)(a), (c), (d) and (e), Article 7(1)(b), (c) and (d), (2), (3) and (5), Article 8, Article 10, Article 13, Article 14, Article 15, and Annexes I, point 2, II, point 5.2 concerning categories A1, A2 and A, IV, V and VI. They shall forthwith communicate to the Commission the text of those provisions. 2. They shall apply those provisions as from 19 January 2013. 3. When Member States adopt those provisions, they shall contain a reference to this Directive or shall be accompanied by such reference on the occasion of their official publication. They shall also contain an indication that references made, in the laws, regulations or administrative provisions in force, to the repealed Directive shall be construed as being made to this Directive. The methods of making such reference, and its wording, shall be laid down by Member States. Directive 91/439/EEC shall be repealed with effect from 19 January 2013, without prejudice to the obligations of the Member States with regard to the deadlines indicated in Annex VII, Part B for transposing that Directive into national law. Article 2(4) of Directive 91/439/EEC shall be repealed on 19 January 2007. References made to the repealed Directive shall be construed as being made to this Directive and should be read in accordance with the correlation table in Annex VIII. Article 2(1), Article 5, Article 6(2)(b), Article 7(1)(a), Article 9, Article 11(1), (3), (4), (5) and (6), Article 12, and Annexes I, II and III shall apply from 19 January 2009. Done at Brussels, 20 December 2006. (1) OJ C 112, 30.4.2004, p. 34. (2) Opinion of the European Parliament of 23 February 2005 (OJ C 304 E, 1.12.2005, p. 202), Council Common Position of 18 September 2006 (OJ C 295 E, 5.12.2006, p. 1) and Position of the European Parliament of 14 December 2006 (not yet published in the Official Journal). Council Decision of 19 December 2006. (3) OJ L 237, 24.8.1991, p. 1. Directive as last amended by Regulation (EC) No 1882/2003 of the European Parliament and of the Council (OJ L 284, 31.10.2003, p. 1). (5) OJ L 124, 9.5.2002, p. 1. Directive as last amended by Commission Directive 2005/30/EC (OJ L 106, 27.4.2005, p. 17). (6) OJ L 226, 10.9.2003, p. 4. Directive as amended by Council Directive 2004/66/EC (OJ L 168, 1.5.2004, p. 35). The physical characteristics of the card of the Community model driving licence shall be in accordance with ISO 7810 and ISO 7816-1. The card shall be made of polycarbonate. Methods for testing the characteristics of driving licences for the purpose of confirming their compliance with the international standards shall be in accordance with ISO 10373. The overall security lies in the system in its entirety, consisting of the application process, the transmission of data, the card body material, the printing technique, a minimum set of different security features and the personalisation process. in the area of the photograph the security design background and photograph should overlap on at least its border (weakening pattern). tactile characters, symbols or patterns*. Member States are free to introduce additional security features. As a basis, the techniques indicated with an asterisk are to be preferred as they enable the law enforcement officers to check the validity of the card without any special means. The licence shall have two sides. additional information/restriction(s), in code form, facing the (sub)category affected. Driver having completed training or having passed a test of skills and behaviour in accordance with the provisions of Annex V.
national codes valid only for driving in the territory of the Member State which issued the licence. a space reserved for the possible entry by the Member State which issues the licence of information essential for administering the licence or related to road safety (optional). If the information relates to one of the headings defined in this Annex, it should be preceded by the number of the heading in question. a space shall be reserved on the Community model licence to allow for the possible introduction of a microchip or similar computer device. Where the holder of a driving licence issued by a Member State in accordance with this Annex has his normal place of residence in another Member State, that Member State may enter in the licence such information as is essential for administering it, provided that it also enters this type of information in the licences which it issues and provided that there remains enough space for the purpose. After consulting the Commission, Member States may add colours or markings, such as bar codes and national symbols, without prejudice to the other provisions of this Annex. In the context of mutual recognition of licences, the bar code may not contain information other than what can already be read on the driving licence or which is essential to the process of issuing the licence. Note: a pictogram and a line for category AM will be added. Note: the term ‘A2’ will be added to the section on motorcycle categories. The conditions under which these tests shall be conducted are set out below. The form chosen shall be such as to make sure that the applicant has the required knowledge of the subjects listed on points 2, 3 and 4. Any applicant for a licence in one category who has passed a theory test for a licence in a different category may be exempt from the common provisions of points 2, 3 and 4. Rules regarding vehicle use in relation to the environment (appropriate use of audible warning devices, moderate fuel consumption, limitation of pollutant emissions, etc.). Mechanical aspects with a bearing on road safety as laid down above with additional attention to the emergency stop switch, the oil levels and the chain. The driver's responsibility in respect to the carriage of passengers; comfort and safety of passengers; transport of children; necessary checks before driving away; all sorts of buses should be part of the theory test (public service buses and coaches, buses with special dimensions, …) (categories D, DE, D1, D1E only). The driver's responsibility in respect of the receipt, carriage and delivery of goods in accordance with the agreed conditions (categories C, CE only). The driving of a vehicle with manual transmission shall be subject to the passing of a skills and behaviour test taken on a vehicle with manual transmission. If an applicant takes the test of skills and behaviour on a vehicle with automatic transmission this shall be recorded on any licence issued on the basis of such a test. Licences with this indication shall be used only for driving vehicles with automatic transmission. The vehicles used in tests of skills and behaviour shall comply with the minimum criteria given below. Member States may make provisions for more stringent criteria or add others. Testing vehicles for categories BE, C, CE, C1, C1E, D, DE, D1 and D1E which are not in conformity with the minimum criteria given above but which were in use on or before the moment of entry into force of this Directive, may still be used for a period not exceeding ten years after that date. The requirements related to the load to be carried by these vehicles, may be implemented by Member States up to ten years from the moment of entry into force of Commission Directive 2000/56/EC (3). Perform a random check on the condition of the tyres, brakes, steering, emergency stop switch (if applicable), chain, oil levels, lights, reflectors, direction indicators and audible warning device. Braking: at least two braking exercises shall be executed, including an emergency brake at a minimum speed of 50 km/h; this should allow competence to be assessed in handling of the front and rear brake, vision direction and the position on the motorcycle. The special manoeuvres mentioned under points 6.2.3 to 6.2.5 have to be implemented at the latest five years after entry into force of Directive 2000/56/EC. Taking the necessary precautions when getting off the vehicle. Checking the coupling mechanism and the brake and electrical connections (category BE only). Braking accurately to a stop; however, performing an emergency stop is optional. Taking the necessary precautions when alighting from the vehicle. Reading a road map, route planning, including the use of electronic navigation systems (optional). Parking to let passengers on or off the bus safely (categories D, DE, D1, D1E only). For each of the abovementioned driving situations, the assessment must reflect the degree of ease with which the applicant handles the vehicle controls and his demonstrated capacity to drive in traffic in complete safety. The examiner must feel safe throughout the test. Driving errors or dangerous conduct immediately endangering the safety of the test vehicle, its passengers or other road users shall be penalised by failing the test, whether or not the examiner or accompanying person has to intervene. Nonetheless, the examiner shall be free to decide whether or not the skills and behaviour test should be completed. Driving examiners must be trained to assess correctly the applicants' ability to drive safely. The work of driving examiners must be monitored and supervised, by a body authorised by the Member State, to ensure correct and consistent application of fault assessment in accordance with the standards laid down in this Annex. During their assessment, driving examiners shall pay special attention to whether an applicant is showing a defensive and social driving behaviour. This should reflect the overall style of driving and the driving examiner should take this into account in the overall picture of the applicant. It includes adapted and determined (safe) driving, taking into account road and weather conditions, taking into account other traffic, taking into account the interests of other road users (particularly the more vulnerable) and anticipation. Braking and stopping: decelerating in time, braking or stopping according to circumstances; anticipation; using the various braking systems (only for categories C, CE, D, DE); using speed reduction systems other than the brakes (only for categories C, CE, D, DE). The length of the test and the distance travelled must be sufficient to assess the skills and behaviour laid down in paragraph B of this Annex. In no circumstances should the time spent driving on the road be less than 25 minutes for categories A, A1, A2, B, B1 and BE and 45 minutes for the other categories. This does not include the reception of the applicant, the preparation of the vehicle, the technical check of the vehicle with a bearing on road safety, the special manoeuvres and the announcement of the outcome of the practical test. The part of the test to assess the special manoeuvres may be conducted on a special testing ground. Wherever practicable, the part of the test to assess behaviour in traffic should be conducted on roads outside built-up areas, expressways and motorways (or similar), as well as on all kinds of urban streets (residential areas, 30 and 50 km/h areas, urban expressways) which should represent the various types of difficulty likely to be encountered by drivers. It is also desirable for the test to take place in various traffic density conditions. The time spent driving on the road should be used in an optimal way to assess the applicant in all the various traffic areas that can be encountered, with a special emphasis on changing between these areas. Help ensure the safety of all road users, and in particular of the weakest and most exposed by showing due respect for others. Member States may implement the appropriate measures to ensure that drivers who have lost the knowledge, skills and behaviour as described under points 1 to 9 can recover this knowledge and these skills and will continue to exhibit such behaviour required for driving a motor vehicle. (1) OJ L 370, 31.12.1985, p. 1. Regulation as repealed by Regulation (EC) No 561/2006 of the European Parliament and of the Council (OJ L 102, 11.4.2006, p. 1). (2) OJ L 370, 31.12.1985, p. 8. Regulation as last amended by Regulation (EC) No 561/2006. (3) Commission Directive 2000/56/EC of 14 September 2000 amending Council Directive 91/439/EEC on driving licences (OJ L 237, 21.9.2000, p. 45). drivers of vehicles of categories A, A1, A2, AM, B, B1 and BE. 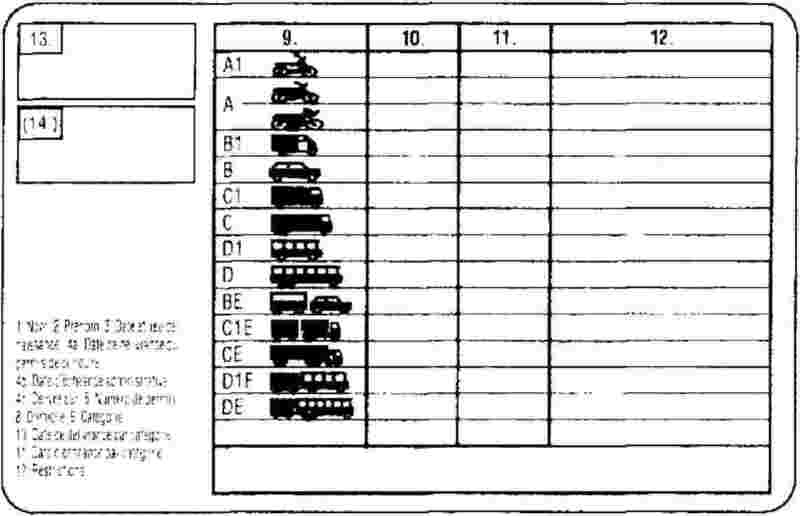 drivers of vehicles of categories C, CE, C1, C1E, D, DE, D1 and D1E. National legislation may provide for the provisions set out in this Annex for Group 2 drivers to apply to drivers of Category B vehicles using their driving licence for professional purposes (taxis, ambulances, etc.). Similarly, applicants for a first driving licence or for the renewal of a driving licence are classified in the group to which they will belong once the licence has been issued or renewed. Applicants shall be required to undergo a medical examination if it becomes apparent, when the necessary formalities are being completed or during the tests which they have to undergo prior to obtaining a driving licence, that they have one or more of the medical disabilities mentioned in this Annex. The standards set by Member States for the issue or any subsequent renewal of driving licences may be stricter than those set out in this Annex. All applicants for a driving licence shall undergo an appropriate investigation to ensure that they have adequate visual acuity for driving power-driven vehicles. Where there is reason to doubt that the applicant's vision is adequate, he shall be examined by a competent medical authority. At this examination attention shall be paid the following in particular: visual acuity, field of vision, twilight vision and progressive eye diseases. For the purpose of this Annex, intra-ocular lenses shall not be considered corrective lenses. Applicants for a driving licence or for the renewal of such a licence shall have a binocular visual acuity, with corrective lenses if necessary, of at least 0,5 when using both eyes together. Driving licences shall not be issued or renewed if, during the medical examination, it is shown that the horizontal field of vision is less than 120o o, apart from exceptional cases duly justified by a favourable medical opinion and a positive practical test, or that the person concerned suffers from any other eye condition that would compromise safe driving. When a progressive eye disease is detected or declared, driving licences may be issued or renewed subject to the applicant undergoing regular examination by a competent medical authority. Applicants for a driving licence, or for the renewal of such a licence, who have total functional loss of vision in one eye or who use only one eye (e.g. in the case of diplopia) must have a visual acuity of at least 0,6, with corrective lenses if necessary. The competent medical authority must certify that this condition of monocular vision has existed sufficiently long to allow adaptation and that the field of vision in this eye is normal. Applicants for a driving licence or for the renewal of such a licence must have a visual acuity, with corrective lenses if necessary, of at least 0,8 in the better eye and at least 0,5 in the worse eye. If corrective lenses are used to attain the values of 0,8 and 0,5, the uncorrected acuity in each eye must reach 0,05, or else the minimum acuity (0,8 and 0,5) must be achieved either by correction by means of glasses with a power not exceeding plus or minus 8 dioptres or with the aid of contact lenses (uncorrected vision = 0,05). The correction must be well tolerated. Driving licences shall not be issued to or renewed for applications or drivers without a normal binocular field of vision or suffering from diplopia. Driving licences may be issued to or renewed for applicants or drivers in Group 2 subject to the opinion of the competent medical authorities; particular account will be taken in medical examinations of the scope for compensation. Driving licences shall not be issued to or renewed for applicants or drivers suffering from complaints or abnormalities of the locomotor system which make it dangerous to drive a power-driven vehicle. Driving licences subject to certain restrictions, if necessary, may be issued to physically disabled applicants or drivers following the issuing of an opinion by a competent medical authority. This opinion must be based on a medical assessment of the complaint or abnormality in question and, where necessary, on a practical test. It must also indicate what type of modification to the vehicle is required and whether the driver needs to be fitted with an orthopaedic device, insofar as the test of skills and behaviour demonstrates that with such a device driving would not to be dangerous. Driving licences may be issued to or renewed for any applicant suffering from a progressive complaint on condition that the disabled person is regularly examined to check that the person is still capable of driving the vehicle completely safely. Where the disability is static, driving licences may be issued or renewed without the applicant being subject to regular medical examination. The competent medical authority shall give due consideration to the additional risks and dangers involved in the driving of vehicles covered by the definition of this group. Any disease capable of exposing an applicant for a first licence or a driver applying for renewal to a sudden failure of the cardiovascular system such that there is a sudden impairment of the cerebral functions constitutes a danger to road safety. Driving licences will not to be issued to, or renewed for, applicants or drivers with serious arrhythmia. Driving licences may be issued to, or renewed for, applicants or drivers wearing a pacemaker subject to authorised medical opinion and regular medical check-ups. The question of whether to issue or renew a licence for applicants or drivers suffering from abnormal arterial blood pressure shall be assessed with reference to the other results of the examination, any associated complications and the danger they might constitute for road safety. Generally speaking, a driving licence shall not be issued to or renewed for applicants or drivers suffering from angina during rest or emotion. The issuing or renewal of a driving licence to any applicant or driver having suffered myocardial infarction shall be subject to authorised medical opinion and, if necessary, regular medical check-ups. Driving licences may be issued to, or renewed for, applicants or drivers suffering from diabetes mellitus, subject to authorised medical opinion and regular medical check-ups appropriate to each case. Only in very exceptional cases may driving licences be issued to, or renewed for, applicants or drivers in this group suffering from diabetes mellitus and requiring insulin treatment, and then only where duly justified by authorised medical opinion and subject to regular medical check-ups. Driving licences shall not be issued to, or renewed for, applicants or drivers suffering from a serious neurological disease, unless the application is supported by authorised medical opinion. Neurological disturbances associated with diseases or surgical intervention affecting the central or peripheral nervous system, which lead to sensory or motor deficiencies and affect balance and coordination, must accordingly be taken into account in relation to their functional effects and the risks of progression. In such cases, the issue or renewal of the licence may be subject to periodic assessment in the event of risk of deterioration. A licence may be issued or renewed subject to an examination by a competent medical authority and to regular medical check-ups. The authority shall decide on the state of the epilepsy or other disturbances of consciousness, its clinical form and progress (no seizure in the last two years, for example), the treatment received and the results thereof. Driving licences shall not be issued to or renewed for applicants or drivers suffering or liable to suffer from epileptic seizures or other sudden disturbances of the state of consciousness. unless their application is supported by authorised medical opinion and, if necessary, subject to regular medical check-ups. Alcohol consumption constitutes a major danger to road safety. In view of the scale of the problem, the medical profession must be very vigilant. Driving licences shall not be issued to, or renewed for, applicants or drivers who are dependent on alcohol or unable to refrain from drinking and driving. After a proven period of abstinence and subject to authorised medical opinion and regular medical check-ups, driving licences may be issued to, or renewed for, applicant or drivers who have in the past been dependent on alcohol. Driving licences shall not be issued to or renewed for applicants or drivers who are dependent on psychotropic substances or who are not dependent on such substances but regularly abuse them, whatever category of licence is requested. Driving licences shall not be issued to, or renewed for, applicants or drivers who regularly use psychotropic substances, in whatever form, which can hamper the ability to drive safely where the quantities absorbed are such as to have an adverse effect on driving. This shall apply to all other medicinal products or combinations of medicinal products which affect the ability to drive. The competent medical authority shall give due consideration to the additional risks and dangers involved in the driving of vehicles covered by the definitions of this group. Driving licences may be issued or renewed for applicants and drivers suffering from serious renal insufficiency subject to authorised medical opinion and regular medical check-ups. Save in exceptional cases duly justified by authorised medical opinion, and subject to regular medical check-ups, driving licences shall not be issued to or renewed for applicants or drivers suffering from serious and irreversible renal deficiency. Subject to authorised medical opinion and, if necessary, regular medical check-ups, driving licences may be issued to or renewed for applications or drivers who have had an organ transplant or an artificial implant which affects the ability to drive. As a general rule, where applicants or drivers suffer from any disorder which is not mentioned in the preceding paragraph but is liable to be, or to result in, a functional incapacity affecting safety at the wheel, driving licences shall not be issued or renewed unless the application is supported by authorised medical opinion and, if necessary, subject to regular medical check-ups. A person authorised to conduct practical assessments in a motor vehicle of the driving performance of a candidate must have knowledge, skills and understanding related to the topics listed in points 1.2 to 1.6. The competences of an examiner must be relevant to assessing the performance of a candidate seeking the category of driving licence entitlement for which the driving test is being undertaken. A person authorised to conduct a practical test for a category of driving licence must be able to drive to a consistently high standard that type of motor vehicle. treat candidates with respect and indiscriminately. knowledge about vehicle physics such as speed, friction, dynamics, energy. Driving in a fuel efficient and environmentally friendly way. may not be active as a commercial driving instructor in a driving school simultaneously. Member States may authorise an examiner to conduct driving tests for categories AM, A1, A2 and A upon passing the initial qualification prescribed in point 3 for one of these categories. Member States may authorise an examiner to conduct driving tests for categories C1, C, D1 and D upon passing the initial qualification prescribed in point 3 for one of these categories. Member States may authorise an examiner to conduct driving tests for categories BE, C1E, CE, D1E and DE upon passing the initial qualification prescribed in point 3 for one of these categories. Before a person may be authorised to conduct driving tests, that person must satisfactorily complete such training programme as a Member State may specify in order to have the competences set out in point 1. Member States must determine whether the content of any particular training programme will relate to authorisation to conduct driving tests for one driving licence category, or more than one. Before a person may be authorised to conduct driving tests, that person must demonstrate a satisfactory standard of knowledge, understanding, skills and aptitude in respect of the subjects listed in point 1. Member States shall operate an examination process that assesses, in a pedagogically appropriate manner, the competences of the person as defined under point 1, in particular point 1.4. The examination process must include both a theoretical element and a practical element. Computer-based assessment may be used where appropriate. The details concerning the nature and duration of any tests and assessments within the examination shall be at the discretion of the individual Member States. Member States must determine whether the content of any particular examination will relate to authorisation to conduct driving tests for one driving licence category, or more than one. Member States shall have in place quality assurance arrangements to provide for the maintenance of standards of driving examiners. Quality assurance arrangements should involve the supervision of examiners at work, their further training and re-accreditation, their continuing professional development, and by periodic review of the outcomes of the driving tests that they have conducted. Member States must provide that each examiner is subject to yearly supervision making use of quality assurance arrangements listed in point 4.1.2. Moreover, the Member States must provide that each examiner is observed conducting tests once every 5 years, for a minimum period cumulatively of at least half a day, allowing the observation of several tests. When issues are identified corrective action should be put in place. The person undertaking the supervision must be a person authorised by the Member State for that purpose. Member States may provide that where an examiner is authorised to conduct driving tests in more than one category, satisfying the supervision requirement in relation to tests for one category satisfies the requirement for more than one category. The work of driving examination must be monitored and supervised by a body authorised by the Member State, to ensure correct and consistent application of assessment. in order to develop and maintain the necessary practical driving skills. Member States shall take the appropriate measures for ensuring that specific training is given promptly to those examiners that have found to be seriously malfunctioning by the quality assurance system in place. The nature of periodic training may take the form of briefing, classroom training, conventional or electronic-based learning, and it may be undertaken on an individual or group basis. It may include such re-accreditation of standards as Member States consider appropriate. 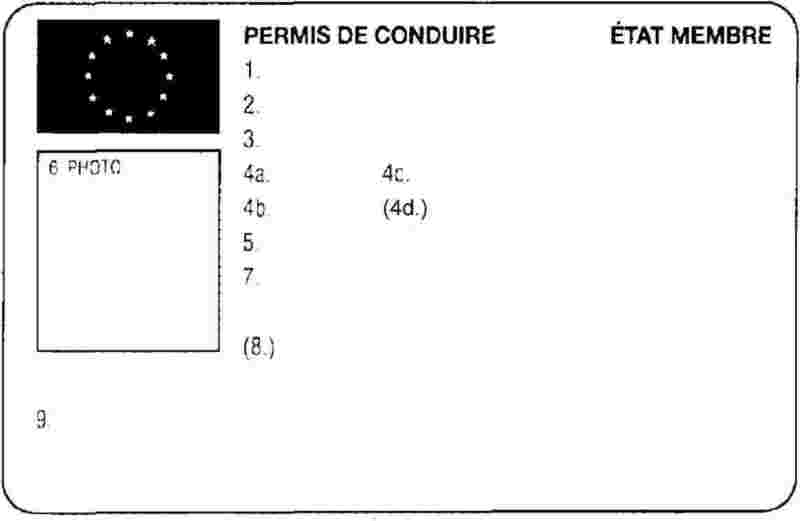 Member States may provide that where an examiner is authorised to conduct driving tests in more than one category, satisfying the periodic training requirement in relation to tests for one category satisfies the requirement for more than one category, provided the condition set out in point 4.2.5 is satisfied. Where an examiner has not conducted tests for a category within a 24-month period, the examiner shall undertake a suitable reassessment before being allowed to carry out driving tests relating to that category. That re-assessment may be undertaken as part of the requirement set out in point 4.2.1. Member States may allow persons authorised to conduct driving tests immediately before these provisions come into force to continue to conduct driving tests, notwithstanding that they were not authorised in accordance with the general conditions in point 2 or the initial qualification process set out in point 3. Such examiners are nonetheless subject to the regular supervision and quality assurance arrangements set out in point 4. (1) OJ L 199, 31.7.1985, p. 56.
organise the test of skills and behaviour provided for in Article 7(1)(d). Vehicle combinations used for the training shall fall within the category of driving licence participants have applied for. The length of the test and the distance travelled must be sufficient to assess the skills and behaviour laid down in point 3.
organise the test of skills and behaviour provided for in Article 7(1)(c). The driver training shall contain all aspects covered in point 6 of Annex II. Each participant has to perform the practical components of the training and shall demonstrate its skills and behaviour on public roads. Motorcycles used for the training shall fall within the category of driving licence participants have applied for. The length of the test and the distance travelled must be sufficient to assess the skills and behaviour laid down in point 3 of this Annex. (1) Directive 91/439/EEC was also amended by the following act which has not been repealed: 1994 Act of accession.